It’s amazing the way the minute I say I don’t care about shrinking Mt TBR it goes and shrinks. A lot of it was due to Aurealis reading, which had to be wrapped up. However, I also did a bit of decluttering. It’s nice to have the pile below 400 books again. Aurora: Aurizun by Amanda Bridgeman — DONE! Tides of the Titans by Thoraiya Dyer — My copy of this still hasn’t arrived from the publisher, so I’m going to have to hunt one down. Descendant of the Crane by Joan He — Pushed back to February. Six of Crows by Leigh Bardugo — As expected, this also had to be pushed back to February. An Absolutely Remarkable Thing by Hank Green — DONE! 1. Lady Helen and the Dark Days Deceit by Alison Goodman. Read for the Aurealis Awards. Historical fantasy. Lady Helen struggles to balance wedding preparations with her hunt for the Grand Deceiver. 2. Aurora: Aurizun by Amanda Bridgeman. Reviewed here. 3. The Fray by Emily Dale. Read for the Aurealis Awards. Portal fantasy. A soldier with PTSD gets kidnapped and taken to another world where she discovers she’s a princess expected to lead a rebellion. 4. Emergence by Marita Smith. Read for the Aurealis Awards. Sci-fi. Teenagers with the genetic ability to cross to the spirit world must avert a catastrophe while on the run from an organisation who wants to uncover the secret of their abilities. 5. Terracotta Pomegranate by Julie Reeser. Poetry. This small collection had some lovely pieces and a strong focus on natural imagery, which I appreciated. 6. 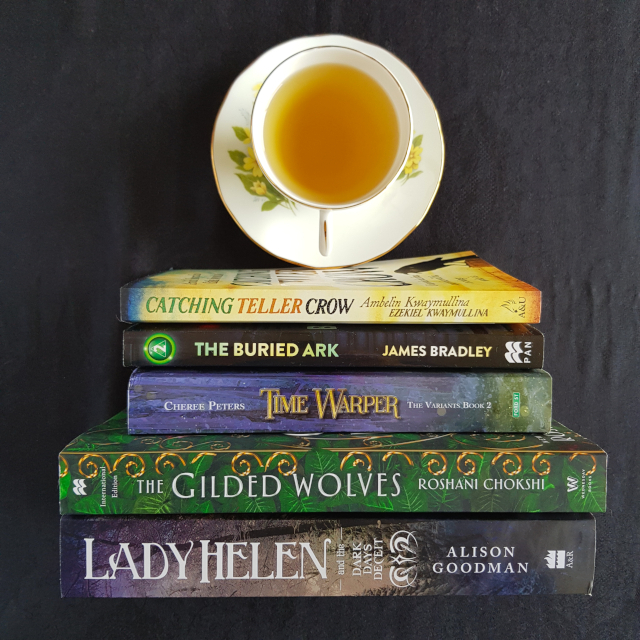 The Gilded Wolves by Roshani Chokshi. Reviewed here. 7. Stratification by Ilsa Evans. Read for the Aurealis Awards. Post apocalyptic sci-fi. Grady is set to take over from her mother as Seer of her village, but all she wants to do is go travelling with her friends. She gets that opportunity when things go wrong after a visit from a demi-god. 8. The Cycle of Harm by M.H. Snowy. Read for the Aurealis Awards. Fantasy. A shady magician and long-time friend may have the key to the berserker Harm’s memory issues but not his best interest at heart. 9. The Life-Changing Magic of Tidying Up by Marie Kondo. A non-fiction book laying out the KonMari method of tidying up. It’s not often I say this, but the TV series is much better, conveying the same basic info without the strong self-help vibes. 10. The Kingdom of Copper by S.A. Chakraborty. Historical fantasy. Second in the Daevabad Trilogy. Five years on, Nahri has embraced her heritage and Ali finds purpose in his exile. However, circumstances soon reunite them in Daevabad as they seek to mitigate the harm caused by the tyrannical rule of Ali’s father. 11. An Absolutely Remarkable Thing by Hank Green. Contemporary sci-fi. After shooting a YouTube video of what she thinks is an art installation, April May finds herself famous overnight. An interesting meditation on the nature of fame with some interesting worldbuilding. Some of the characters felt a little bit flat for me, but I enjoyed its generally optimistic message. 12. Catching Teller Crow by Ambelin and Ezekiel Kwaymullina. Read for the Aurealis Awards. A ghost girl follows her detective father to a small country town to solve a murder. 13. A Different Boy by Paul Jennings. Read for the Aurealis Awards. An orphaned boy struggles to find his place in the world. 14. Deception by Teri Terry. Read for the Aurealis Awards. Science fiction. A group of teenagers search for the truth behind an epidemic that leaves its survivors with strange powers. 15. Time Warper by Cheree Peters. Read for the Aurealis Awards. Science fiction. Thea’s memories gradually return as she and her friends seek to hide from her old life. 16. The Buried Ark by James Bradley. Read for the Aurealis Awards. Science fiction. Separated from her loved ones, Callie finds an unexpected ally who reveals she may be the key to saving the world from the Change. 17. Assassins of the Dead 3: Society Against Vampires by Avril Sabine. Read for the Aurealis Awards. Meikah must prove the innocence of her vampire friends in order to prevent them being unjustly punished. 18. Demon Hunters 6: Feud by Avril Sabine. Read for the Aurealis Awards. Fantasy. Aura tries to protect her mum from the demons hunting them, but her mum sure doesn’t make that easy. 19. Dragon Blood Chronicles 2: Betrayal by Avril Sabine. Read for the Aurealis Awards. Fantasy. A gold dragon finds herself torn between two worlds when her human friend is kidnapped. 20. A Dream Passage by J.D.E Saville. Read for the Aurealis Awards. In a world where things are dreamed into existence, Tomas faces his passage to adulthood. Taking it means never seeing his best friend again. 21. The Trytth Chronicles by Goldie Alexander. Read for the Aurealis Awards. A sci-fi retelling of The Tempest. 22. Guardians of the Round Table 2: Goblin Boots by Avril Sabine, Storm Petersen and Rhys Petersen. Read for the Aurealis Awards. Fantasy. Mallory and her friends return to the fantasy world they found in their computer game, only to discover the presence of a bigger enemy. 23. Guardians of the Round Table 3: Singed Feathers by Avril Sabine, Storm Petersen and Rhys Petersen. Read for the Aurealis Awards. Mallory and her friends have their routine down to a fine art now. However, their cockiness lands them in trouble. 24. Plea of the Damned 5: Forgive Me Marti by Avril Sabine. Read for the Aurealis Awards. Fantasy. In order to move on to the afterlife, a ghost helps a young girl track down her grandfather’s motorbike. 25. Realms of the Fae 4: An Unexpected Betrayal by Avril Sabine. Read for the Aurealis Awards. Fantasy. The statues Trinity rescues from demolition turn out to be more than they appear. 26. Rosie’s Rangers 4: Accused by Avril Sabine. Read for the Aurealis Awards. Fantasy. A friend of Caz’s arrives to beg for help, but Rosie’s not convinced of their innocence. 27. Small Spaces by Sarah Epstein. Read for the Aurealis Awards. Psychological horror. When she was young, Tash saw her imaginary friend abduct a young girl. Years later, the girl and her family return to town. Tash finds herself reconnecting with them, but strange things are happening around her, forcing her to wonder whether she’s finally losing the plot. Descendant of the Cranes by Joan He. For review at Skiffy and Fanty. Six of Crows by Leigh Bardugo. Book club pick for February. The Raven Tower by Ann Leckie. For review at EGE. Sherwood by Meagan Spooner. For review at Skiffy and Fanty. Parable of the Sower. February pick for the Lady Vaults book club.